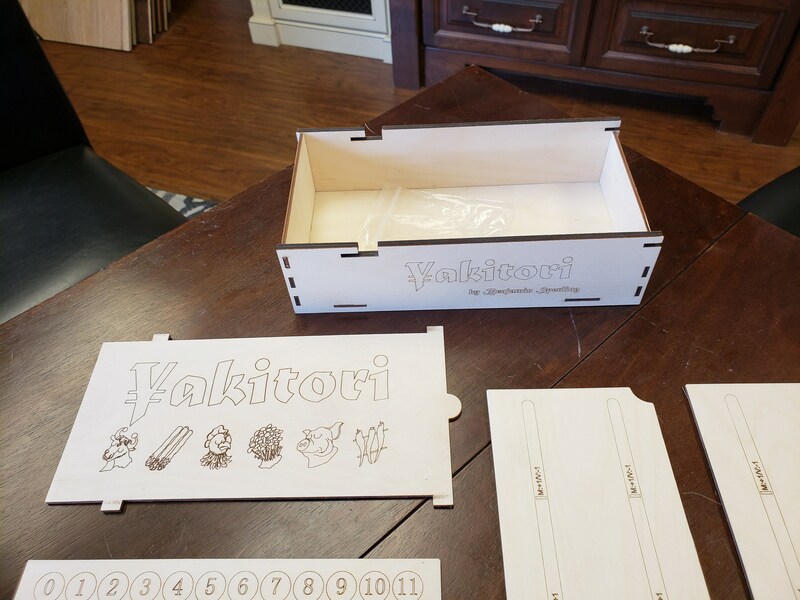 Yakitori is back with a more streamlined design. We know you are hungry for more food themed game play. So we are going to be satisfying your enormous appetite for fun games with our quick cooking, finger-licking-good food on skewer based worker placement tile game. 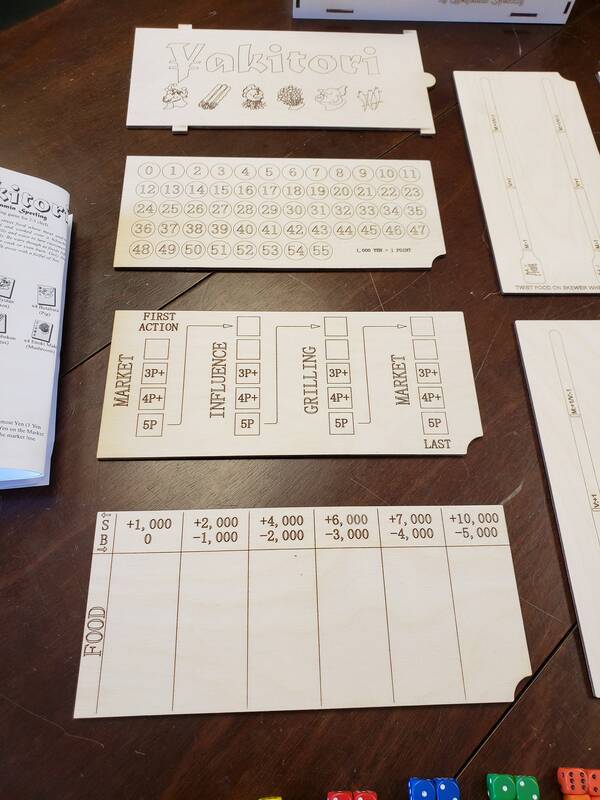 The objective of the game is to accrue the most Yen at the end of the game by buying foodstuffs, grilling it on your hibachi and selling it to hungry customers. Along the way you can influence the market to drive up the demand for your particular foodstuffs. The action is fast and you need to plan ahead to make sure you get to do everything you want to do each round. 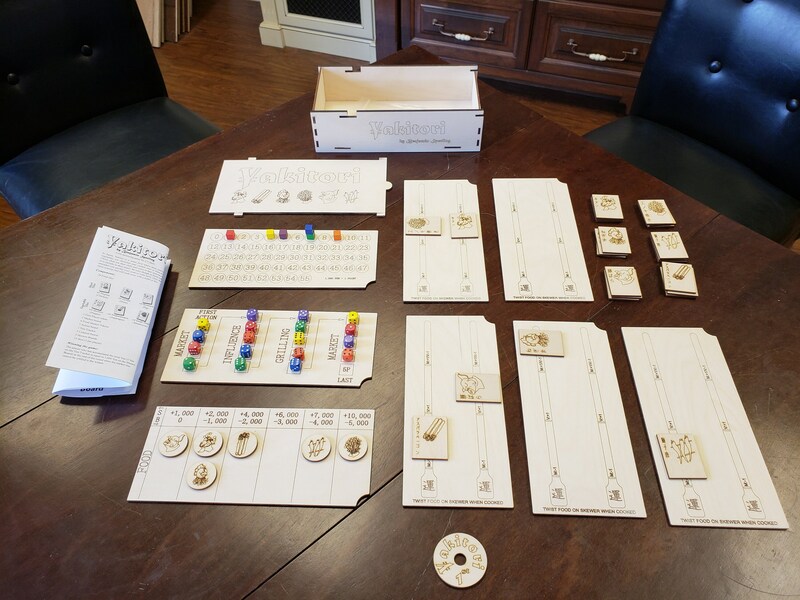 The box is made of 1/4" Baltic Birch, the game boards and skewers are made of 1/8" baltic birch. The tiles are made up of 1/8" baltic birch and are 1 1/2" wide by 2" long. 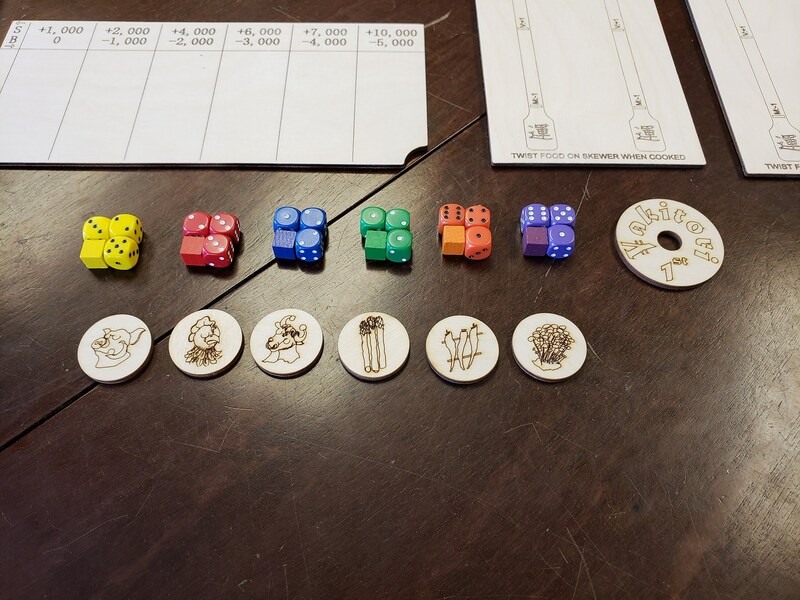 The game includes 5 sets of 3 six sided die, each set being a different color, it also includes 5 different colored wooden cubes. 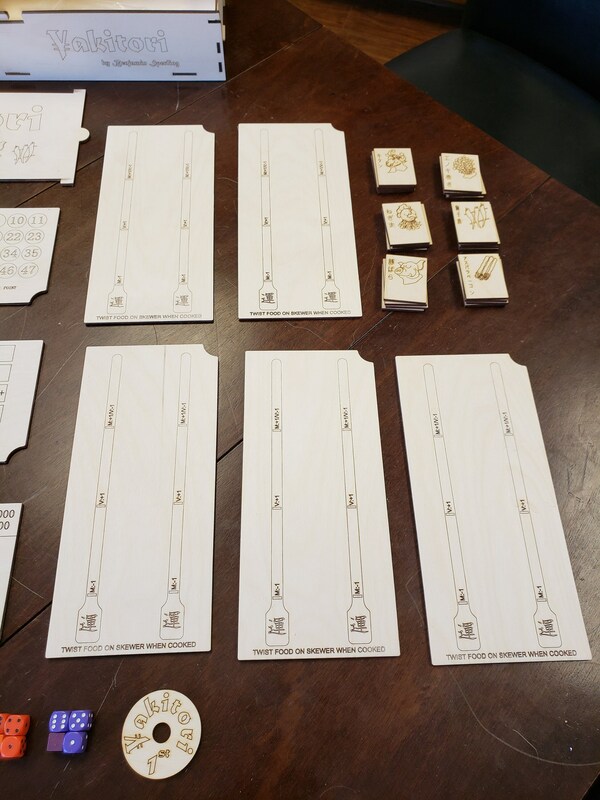 There is a first player token, 6 food tokens, 5 wooden skewers player mats, and the rules to play. 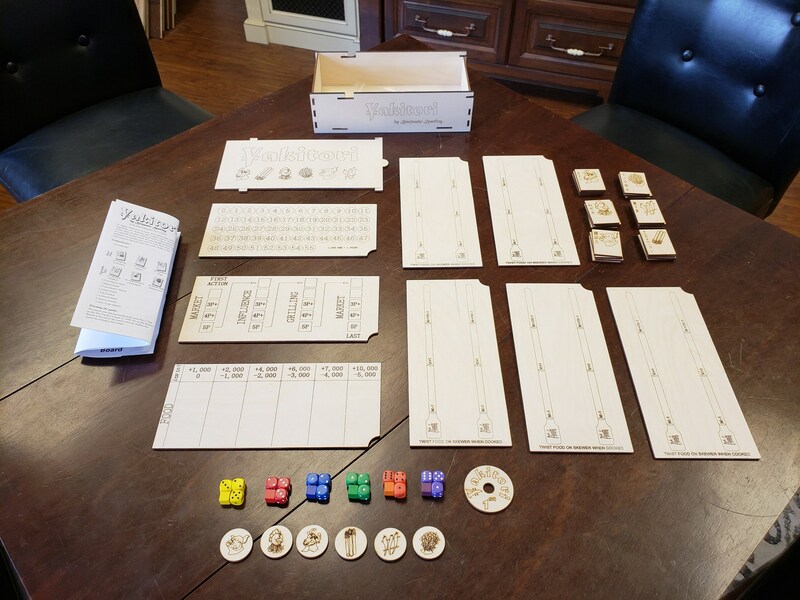 There are two versions we are offering, the traditional Yakitori version and then the Vegan edition that features no animal tiles. This version does not include the Kickstarter exclusives which were the Unlucky Rabbit tile, or skerwers and dice for a 6th player. If you order more than one, we can combine shipping and refund the extra shipping.